with the addition of an AI Section back in 06 lively debate ensued re water or alcohol, safeguards, tuning, various systems etc. while the section may not be as active as other sections i do believe the information has been of significant help for the turbo'd rotary and it's fans. many of the subjects above have been covered in stickied threads because they are of primary importance. injectant location in relation to the turbo. as with most subjects there is a divided opinion. there is also more opinion than fact. the good news is the realities are out there, they just need to be discovered and that is what this new thread is about. of course we are not examining something that has yet to be done. RiceRacing has pioneered the pre-turbo location for a number of years and probably was following earlier engineering data. numerous members of our club have either tried an A B comparison or simply run pre-turbo. as always on this board we welcome and solicit all contributions on the subject from any perspective. as many are aware, the concept behind the pre-turbo location is pretty simple. a compressor, any compressor, is governed by physical laws. there is a point where additional pressure creates heat/expansion to the point that no more oxygen molecules can be packed into the space. power is all about oxygen. more oxygen, more power. period. at that (rightward) point on a compressor map the RPM line ceases to rise and the line goes static. no more RPM gain. all because of the heat of compression. the pre-turbo concept is to introduce cooling BTUs (latent heat) and thus allow for additional oxygen to be able to enter the compressor volume. more oxygen molecules, more power. RiceRacing is running around 33 psi boost w his setup and maintains a healthy engine. thewird is running in the mid 20s boostwise. Rice runs WM and thewird runs water. as you might expect, results vary. the concept is intriguing and potentially quite significant. i have run AI since 04. my Alkycontrol system worked flawlessly. i chose to run an M10 and M15 nozzle and had many happy experiences with it as did my engine. when a more accurate delivery system emerged (FJO) i made the switch to a solenoid/injector setup using an X Y grid. it also worked perfectly. my third setup was to deliver the methanol thru two fuel injectors running in parallel w my secondary injectors. the system worked well but i may have reached a point where methanol being too large a part of my fuel became unstable. a backfire into my UIM took out a diffuser and my engine. i believe the system was fine, just too much methanol. all my locations were in the greddy elbow. my new setup changes things around. i have a new ECU (ViPEC V88) that can control 8 peak and hold injectors separately. the V88 will run my two AI fuel injectors. one injector is in the elbow and one is pre-turbo. we will tune out using the elbow AI location (only) and then shut it off and tune out w the pre-turbo location. i have switched to water meth 50/50 based on volume. 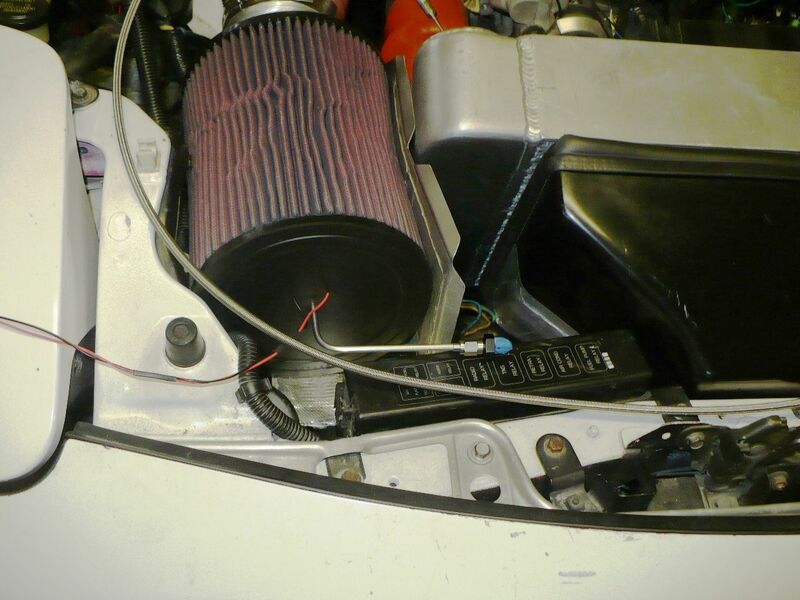 an in process pic showing the airfilter and lines. i run an Alkycontrol pump, a Weldon pressure regulator (boost referenced), a return line from the regulator to my tank and a large Aeromotive filter. i monitor and log the AI pressure (which i run at 110 psi static), air temperature between the turbo and intercooler and also at the stock UIM location. i use a K thermocouple so my readings are instantaneous and accurate. pics are a month or two old as the setup is up and running and at Beyond Redline for evaluation. given this objective are there any benefits to justify re-location? what really is necessary to maintain the compressor wheel integrity? and of course the big question: does the pre-turbo location deliver more oxygen molecules/power? this post hasn't scratched the surface so let's get a conversation started. subscribed for sure. im almost positive that methanols tendency of pre-ignition(as read from other threads especially with platinum plugs) could play a part in a split plate(knock). since then i also decided to run 50/50. already have the nozzle just need the time to relocate and tune(pre-turbo and after). what size nozzle/injector will you be running. im also wondering how total timing will change. my AI injectors are Bosch EV14 1000 CC/Min. the EV14 can run at 8 BAR (116 psi). 1.45 X 1000 is 1455 CC/Min less 13% lag so net max delivery is 1266CC/Min per injector. we will have to wait til we are on the dyno to determine the max delivery. of course it won't be that simple since we have 440 cells available and we will carefully tune each cell. supposedly timing doesn't change w water however water allows you to run more boost and more boost of course leads into areas of the map previously un-tuned... so we will see. the amount of meth is modest and won't effect timing all that much. I will be interested to see how your results come out. I'm planning on building my own system this year, but I am unsure of placement, and using a fast acting value or fuel injector. Do you have any concerns running 50% water through the fuel injectors? I haven't located much data on the Bosch EV14 regarding water effects. i now have the setup that is capable of giving me the data i want and then working the tune. it is going to answer lot of questions. ECU is the Vi-PEC V88. it can run 8 fuel injectors. of course it is running 4 for the base fuel and two which are AI. the AI injectors fire once every crank revolution. the cursor is at 7838 RPM which is the point where the IAT finally exceeds ambient. i am running a 50/50 water meth combo. IAT are measured w an EGT thermocouple and, as such, are literally instantaneous and accurate to a degree or two. the motor duplicated my Jan 2012 power output of 394 at 15 psi. this amazes me because we were hugely richer at average AFR of 10.9 and had 5 degrees less timing in the motor. the big difference was last year was 100% methanol.... no water. well, maybe that wasn't the biggest factor. it seems we were a bit off on setting AI delivery. if you can see the details you will note that the pre turbo injector was at 52.6% injector duty and the OE location was at 151.5%! of course anything higher than 100% is just a nominal calculation. the injector was set at 11 mS, fires once a revolution which takes 7.65 mS. 11/7.65 gets you to approx 1.5.
the pre turbo location had been dialed back V the OE located injector. i find it humorous that one of the primary reasons for my setup was to accurately control the delivery of AI at all points on the map and our first outing was probably further off the mark than i have ever experienced. we were focusing on other things and overall the engine ran well. i have a Vi-PEC Knock Amplifier Kit on the way (headphones to determine knock) and will be back on the dyno as soon as it arrives.... probably March 4/5. we will then be able to focus on trimming the AI table properly and assessing pre-turbo V post turbo AI. this info hopefully will be of help to all. pls give us more info on your setup and intended usage and we may be able to help. No real conclusions here eh? 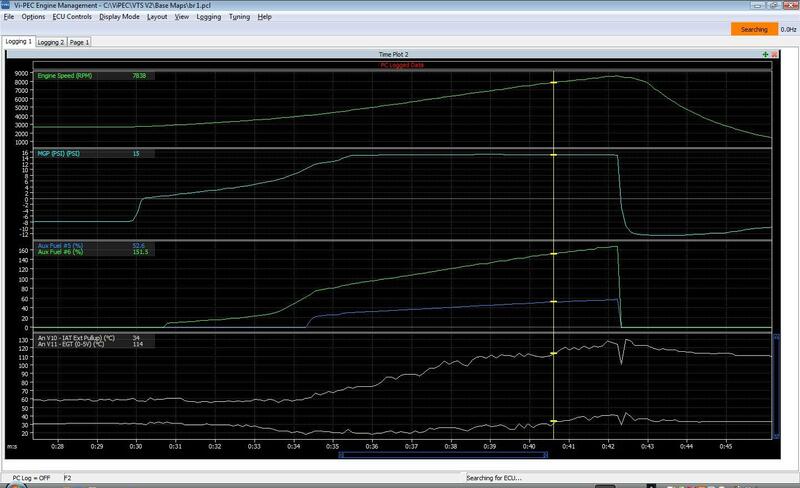 Pre turbo is great, just make sure everything is working properly and failsafes, I made more power during my dyno tests. Now injecting water/meth pre turbo and pre throttle body, more volume is needed compared to just using water, to keep knock low. I haven't been back to the dyno though. just a little thread necro survey ..
how is your oil ? Surely given the fine atomisation of the air/water rigs most are running in pre-turbo setups, the vapour pressure of methanol even at ambient and the incredibly lean AFR the preturbo injection represents there would be no liquid condensation reaching the seal area, even if you were expecting boost blowbye into the core from the compressor side the heat in the turbo/sump system and very lean meth mix would make it almost impossible to create oil contamination as it would stay in gaseous form and be sucked back through the motor or pushed to atmosphere through the vent system? so... pre or post? was thinking about running the AEM kit mostly as a safety feature on my FC (pfc, fmic, stock turbo) and maybe for some not so extreme power gains later. how would turbo size affect you guys' choice of pre or post turbo injection if at all? what other factors affect ones decision? Given that E85 in a Rotary seems to be a lil controversial with regards to the pitting effect on the irons and the effect to the OEM oil seals; not sure what it does to the OEM water seals. AI seems to be the way to go especially with 91 here in CA. I think post intercooler by the elbow location would seem ideal. But i am wondering about how much of a distance from the throttle body it would need to have proper atomization. In extensive testing done by Volvo in the 1980’s on pre-turbo injection, they found that 80,000 to 100,000 miles of pre-turbo injection started to wear the compressor wheel. ...AI seems to be the way to go especially with 91 here in CA. I think post intercooler by the elbow location would seem ideal. But i am wondering about how much of a distance from the throttle body it would need to have proper atomization. Seems like what is an "ideal" location for the nozzle depends on your goals. I use a Greddy elbow for my water-only nozzle, maybe 8" from the T-body. It's worked a charm for years to reduce knock, carbon and engine temps. But since it is only water and that location gives little time of contact with the air, it probably does little for IAT's. So if that's your aim, I wouldn't recommend it. And I suspect "proper atomization" is largely a function of nozzle quality, size and pump psi as much as anything else. Last edited by Sgtblue; 02-05-17 at 02:56 PM. Resonator for a special case. Quick Reply: Pre-Turbo or Post Turbo??????? ?